Eastern senior Kaitlyn Hawk (14) passes to junior Alyson Bailey (24) to start the fast break, in the first half of the Lady Eagles’ 49-21 victory on Thursday in Tuppers Plains, Ohio. TUPPERS PLAINS, Ohio — Defensive dominance. 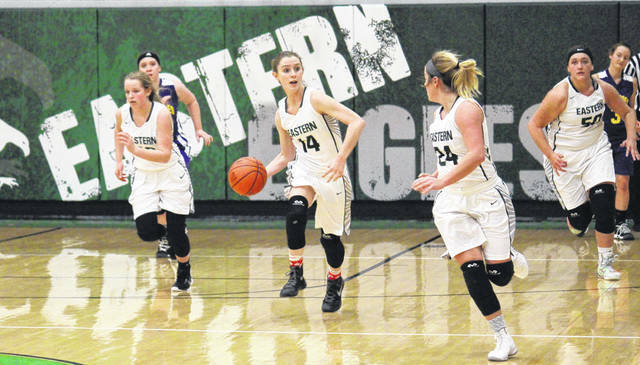 The Eastern girls basketball team forced 23 turnovers and held Tri-Valley Conference Hocking Division guest Southern under 10 percent from the field on Thursday night at ‘The Nest’, as the Lady Eagles soared to a 49-21 victory. The Lady Eagles (7-3, 6-1 TVC Hocking) scored the opening point of the game 23 seconds into play and led the rest of the way. Eastern outscored the Lady Tornadoes (2-7, 1-6) by a 15-4 clip in the first quarter, with EHS hitting seven field goals and SHS making two. Southern was held to just two free throws in the second quarter, as the Lady Eagles extended their lead to 27-6 by the break, combining four field goals with four free throws in the period. The hosts went on a 9-to-5 third quarter run, holding the guests without a field goal for the second straight stanza. Both teams scored two points over the first 1:30 of the fourth quarter and with 6:29 left in the game, Southern ended a 18:26 field goal drought with a Paige VanMeter three-pointer, the only triple hit by either team in the game. After that, Eastern closed out the 49-21 win with a 10-5 run. Eastern shot 19-of-56 (33.9 percent) from the field in the win, missing all-9 of its three-point tries. Southern was just 4-of-42 (9.5 percent) from the field, including 1-of-9 (11.1 percent) from deep. Both teams struggled from the free throw line, SHS shooting 12-of-25 (48 percent) and EHS going 11-of-23 (47.8 percent). 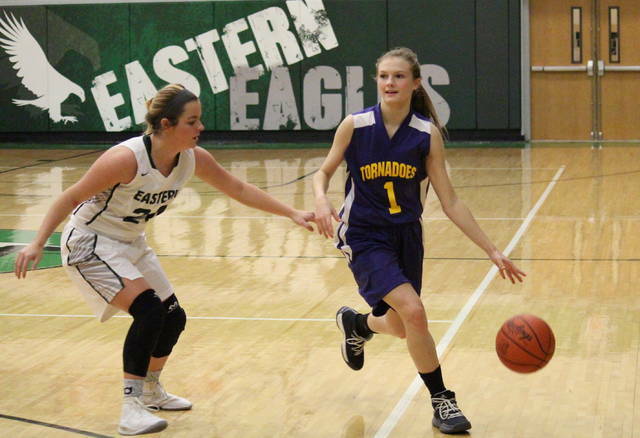 Eastern outrebounded the Lady Tornadoes by a narrow 38-35 count, including 15-to-14 on the offensive end. EHS also claimed advantages of 13-to-2 in assists, 11-to-4 in steals and 4-to-2 in blocked shots. The Lady Eagles gave the ball away 10 times in the game, while Southern committed 23 turnovers. Eastern was led by senior Elizabeth Collins with 18 points and nine rebounds. 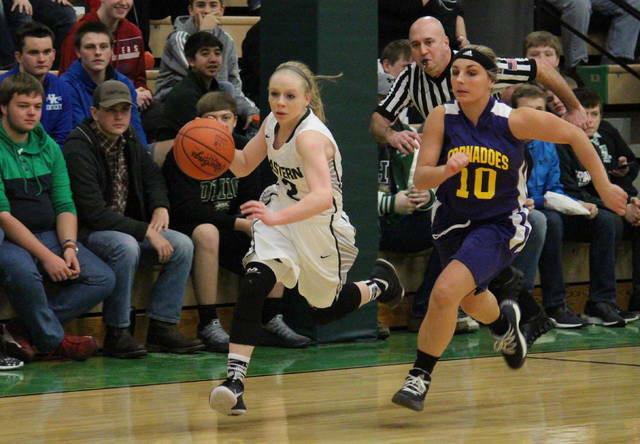 EHS junior Jess Parker scored 14 points in the win, while Alyson Bailey had 12 points and a game-best five assists. Kelsey Casto and Kaitlyn Hawk marked two points apiece for the victors, while Kennadi Rockhold chipped in with one point. Jess Parker led the EHS defense with four steals, while Collins rejected three shots. VanMeter and Phoenix Cleland led Southern with five points apiece, followed by Lauren Lavender and Baylee Wolfe with four each. 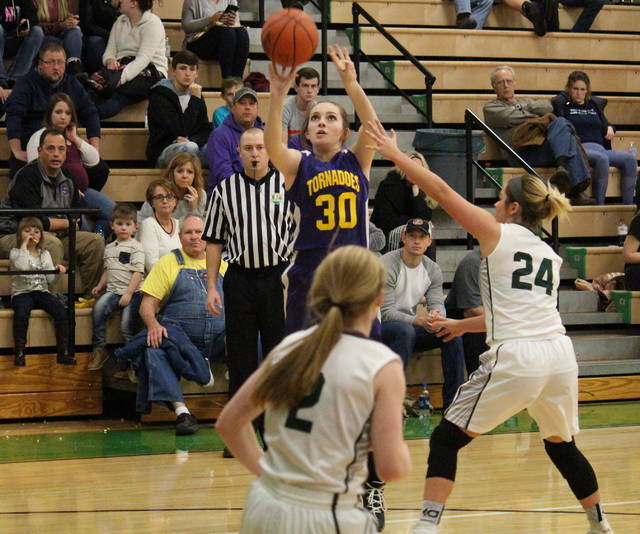 The SHS scoring column was rounded out by Josie Cundiff with two points and Shelbi Dailey with one. Jaiden Roberts led the Purple and Gold on the glass with 10 rebounds, while VanMeter and Lavender each earned an assist. Phoenix Cleland led Southern’s defensive effort with two steals and one blocked shot. These teams are set to rematch on Feb. 5 in Racine. After the Lady Tornadoes visit Clay on Saturday, they’ll host River Valley on Monday. The Lady Eagles travel to Oak Hill on Saturday, then they’ll return home to face Parkersburg on Monday.